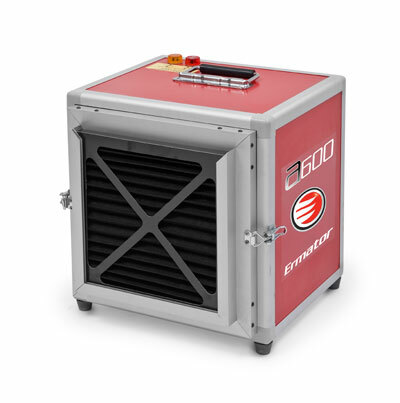 Constructed using a sturdy, compact cabinet, the Model A600 is a quiet operating air scrubber with two airflow speeds of 300 and 600 CFM. The airflow is directed upwards to avoid disturbing dust on surfaces. Each HEPA filter installed in the model A600 is individually tested and certified at an efficiency rate of 99.99% at 0.3 microns. A warning light indicates when the washable primary filter is 75% clogged and requires cleaning. Dimensions: 15" x 17" x 17"